The scratch was deep, two feet long, and spattered with paint flecks. Another vehicle had clearly grazed the side of Duke graduate student Jin Yu’s silver Honda Accord. But the culprit had left no note, no phone number, and no insurance information. Duke graduate student Jin Yu used laser-based imaging to confirm the source of a large scratch on the side of her car. 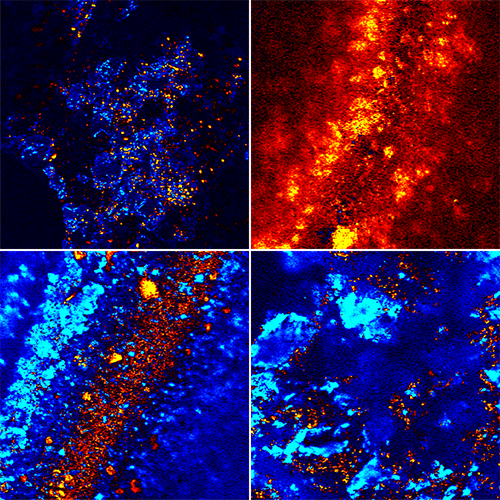 Paint samples from an undamaged area on her Honda Accord (top left) and a suspected vehicle (top right) gave her the unique pump-probe microscopy signatures of the pigments on each car. The damaged areas of the Honda (bottom left) and the suspected vehicle on right (bottom right) show pigment signatures from both vehicles. The timing of the accident, the location of the scratch, and the color of the foreign paint all pointed to a likely suspect: another vehicle in her apartment complex parking lot, also sporting a fresh gash. She had a solid lead, but Yu wasn’t quite satisfied. The chemistry student wanted to make sure her case was rock-solid. “I wanted to show them some scientific evidence,” Yu said. And lucky for her, she had just the tools to do that. As a researcher in the Warren Warren lab, Yu spends her days as scientific sleuth, investigating how a laser-based tool called pump-probe microscopy can be used to differentiate between individual pigments of paint, even if they appear identical to the human eye. The team is developing the technique as a way for art historians and conservators peer under the surface of priceless paintings, without causing damage to the artwork. But Yu thought there was no reason the technique couldn’t be used for forensics, too. Using a clean set of eyebrow tweezers, Yu carefully gathered small flecks of paint from her car and from the suspected vehicle and sealed them up inside individual Ziploc bags. She collected samples both from the scratched up areas, where the paint was mixed, and from undamaged areas on both cars. She left a note on the car, citing the preliminary evidence and stating her plan to test the paint samples. Then, back at the lab, she examined all four samples with the pump-probe microscope. Unlike a standard optical microscope, this device illuminates each sample with a precisely timed series of laser pulses; each pigment absorbs and then re-emits this laser light in a slightly different pattern depending on its chemical structure, creating a unique signature. After finding the gash on her Accord (top left), Yu left a note (top right) on the car that she suspected of having caused the accident. Under an optical microscope, samples from damaged areas on the cars show evidence of the same two kinds of paint (bottom). Yu used pump-probe microscopy to confirm that the pigments in the paint samples matched. The samples from the undamaged areas gave her the characteristic pigment signatures from both of the two vehicles. She then looked at the paint samples taken from the scratched areas. She found clear evidence of paint pigment from the suspected car on her Honda, and clear evidence of paint pigment from her Honda on the suspected car. This was like DNA evidence, of the automotive variety. Fortunately, the owner of the suspect vehicle contacted Yu to confess and pay to have her car fixed, without demanding the results of the paint analysis. “But it was reassuring to have some scientific evidence in case she denied the accident,” Yu said. Yu says she had no interest in forensic science when she started the investigation, but the experience has certainly piqued her curiosity.